Comment: Books has minor signs of wear and usage. Clean pages. Used books may contain minor traces of writing/underlining/highlighting. Ships directly from Amazon! Until now, no book has explored the full expanse of Marshall McLuhan's thinking. Here we have assembled alongside his most prescient aphorisms excerpts from the full range of his astounding life's work. One revolutionary book distills the wisdom and wit of the man who explained to us the "the medium is the message" and that we are "now living in a global village", that "privacy invasion is now our most important knowledge industry" and that "obsolescence is the moment of superabundance". Cover to cover, Anthology is not only one hundred percent McLuhan's own words, these are McLuhan's finest words. McLuhan called these bold perceptions probes and today they gleam like gems embedded everywhere in his life's output - in his books, in more than 200 speeches, in his classes (especially the Monday Night Seminars), and most of all in the nearly 700 shorter writings that he published between 1945 and 1980. 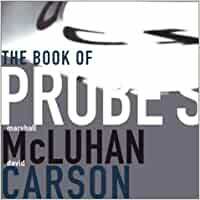 In recent years, his son Eric McLuhan and William Kuhns have combed through all these sources to compile and edit what has become Anthology - The Book of Probes. The collection is so fresh that most probes will be new to even the most avid readers of McLuhan, and opens a new portal to McLuhan's mind, one that promises to change the ways in which we recognize and interpret McLuhan in the future. Readers will marvel at how the consistency, the clarity of concept, and the abundant wealth of observations, some made twenty or thirty years apart, dovetail to form a whole. Art Director and Designer David Carson presents McLuhan's images with new insight, and has built a work of art that is reminiscent of those lasting works permanently commissioned and interpreted by new generations. This is a fat book - often with only two or three McLuhanism on each page. There is some section of regular prose. I loved this book - it gives a concise account of what a 'probe' was for McLuhan and how he used these as powerful was to shake people out of complacent mental models. But more than this - it remains a simple, pleasureable read - that provide page after page of stunning McLuhan at his best - probes that do the same work today as they did when McLuhan first thought of them. I recommend this book - take your time - read a couple of pages every day - let the probes work through your mental landscape. 5 Stars. Reading the advance hype for this book got me very excited. At last! I can understand Marshall McLuhan! Don't get me wrong. It's not that I haven't encountered MM before, but understanding him eluded me. I had hoped for more deluxe versions of the Quentin Fiore collaborations: War and Peace in the Global Village and The Medium is the Massage. But instead of timely, interesting photos, David Carson resorts to typography to frame pithy little McLuhan epigrams. Like those other two books, you at least get your shots of MM one line at a time, and some of the lines are very memorable indeed. Yes, I'm convinced Marshall McLuhan was a prophet (small "P" or maybe big "p"), and that everything he said has already happened. We live in a global village full of hot and cool media; the medium is the message. How obvious it all seems. Reading this book is ancient history. It's already happened. I just wish I could understand it better. Don't bother with the DaVinci code. Crack the McLuhan code and we will all know what's going on. This book reinvents "coffee table books"--it's an 8 inch square two inches thick--so it goes well on little coffee tables from Ikea. I see why they didn't use photos--Corbis owns them all, unlike the public domain galleries in the two earlier books cited (which dazzlingly show more than they tell). Someone new to McLuhan, finding Probes on the tiny coffee table, would probably drink it in, like someone quaffing a particularly good drink. But having finished the tumbler, they'd likely wander off to find the hostess and a refill, asking where she learned her mixology. Those reading, or rather encountering, Probes will also be left inquiring about McLuhan, and probing for more understanding. High praise to Gingko Press for such a beautiful book in both construction and graphics, a retrieval and development on the original Quentin Fiore collaborations of the sixties. And this is no ordinary book of quotations, organized by topic or chronology. Each quote indeed acts as a probe for the reader, and of the reader; and collectively each of the hundreds of isolated insights echo and haunt the others. The effect is similar to the famous Monday night seminars; close the book and you are not quite sure what you've learned, but walk around and the way you see the culture has been changed. For the literati, there is an introduction and an important essay by W. T. Gordon describing McLuhan's debt to de Saussure's linquistics. But this is not a book for the scholars and their after-the-crime-has-been-committed analysis. This is a book for the streets, not the ivory tower, for the poets and novelists, the misfits and malcontents of the digital consensus. It's a good review for those familar with McLuhan, and should be a fine introduction to a new generation of independent media scholars. Don't send anything to David Carson that you need back, he likes to "lose" things. First of all, I'm baffled about previous posters claiming Carson is not the designer here with no explanation for the charge. Secondly, does it really matter if Carson assistants contributed under his guidance (if that be the case)? I'm a big fan of Marshall McLuhan and Carson, so I was pre-disposed to a welcome reception of this volume, and indeed I feel it delivers the goods. At times Carson's designs appear perhaps unnecessarily minimalist, until one considers what must be his reverence for the top billing - McLuhan's probes. McLuhan's 'probes' are ironizable (self-deconstructing) conceptual assertions intended to serve the phenomenological purpose of disclosing new percepts about the world. And in this way the book delivers effectively if used as such. The art in THE BOOK OF PROBES starts early, with pictures and computer graphics generated by David Carson going out of the blue and into the black on pages 4-400 including 33 pages preceding the author, title, list of editors, and contents, which lists "Probes 8 - 545" for pages that have a mixture of such art, Commentary on pages 403-448 and Fragments, before the Album with regular pictures, explanations, and credits on pages 547-574. People familiar with the book will become able to find portions by checking the color of the edges of the pages. Pages 4-33 and 54-397 are white along the bottom, in a strip which includes tiny page numbers; pages 402-425 (except for the yellow strip on the bottom of pages 405-406) have the numbers in a blue strip; pages 440-449 have a green bottom strip; etc. The primary concern is with communication, but I would like to pick up the pieces in the alphabetically arranged Fragments that suggest how closely the atomic nature of evidence of modernity includes expectations of a mushroom cloud in our future. "All invention is a form of bodily fission, with the ensuing chain reaction in the body and the environment." (p. 456). "Light is information without `content,' much as the missile is a vehicle without the additions of wheel or highway. As the missile is a self-contained transportation system that consumes not only fuel but its engine, so light is a self-contained communication system in which the medium is the message." (p. 487). "Rapid changes of identity, happening suddenly and in very brief intervals of time, have proved more deadly and destructive of human values than wars fought with hardware weapons." (p. 503). "The environment always manages somehow to be invisible. Only the content, the previous environment, is noticeable. The BOMB itself became content, having had a short reign as environment." (p. 517). "The metropolis is obsolete. Ask the Army." (p. 524). "Western literate man is easily inclined to make moral protests, but is seemingly incapable of recognizing the formal or `acoustic' structure of situations which are disturbing and destroying him." (p. 538). "Smoothness and repetitive order, the attributes of teeth, enter into the very nature of the power structure." (p. 505). The pages with a green strip on the bottom, 441-448, contain "McLuhan and Saussure" by W. Terence Gordon. Saussure's "Course in General Linguuistics" predicted that universal laws of semiotics could be discovered, and McLuhan used `LOM' as his note for Laws of Media "over and over and listing the passages where Saussure's groundwork buttressed the emerging synthesis of ideas that McLuhan would articulate first in 1977 and fully explore in the posthumously published Laws of Media (1988)." (p. 442). Politics is largely the result of accepted terminologies for approaching areas that are perceived as problems, particularly in democracies, where a person's politics provides some frame of reference for picking the future he or she would prefer. "To use a brand of car, drink, smoke or food that is nationally advertised gives a man the feeling that he belongs to something bigger than himself." (p. 535). Spending a trillion dollars for a strategic weapons system that could destroy parts of our world which do not conform to our wishes is like the icing on the cake of modern life.